Shock Totem Publications is proud to announce a new holiday series of books. Back in 2011 we released something a little different: Shock Totem: Holiday Tales of the Macabre and Twisted 2011. 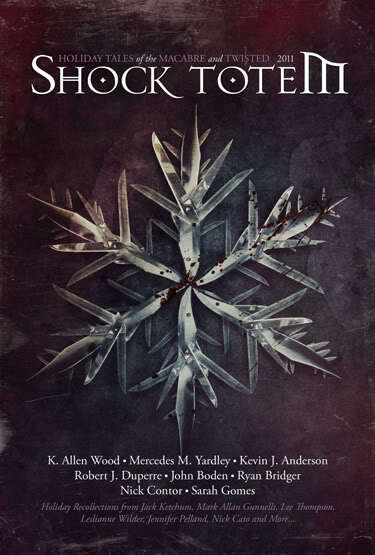 It featured fiction from Shock Totem Publications staff members as well as the wonderful and insanely prolific Kevin J. Anderson, all based on the end-of-the-year holiday season. It also included anecdotal nonfiction pieces from a wide variety of authors. Our sharpest cover to date. Ba-doom tssh! I’ll be here all week, folks. The release was a hit. It sold well and continues to do so. But it was only released as an e-book, and since then many of you have asked for a print version. That is finally coming in late November. Looking beyond that, we have a Valentine’s Day issue planned for late January 2014 and a Halloween issue planned for October 2014. This is a cover mock-up. Listed authors are subject to change. As with the first holiday issue, these releases will feature fiction based on their specific holiday themes. Nonfiction will come from not only authors but the artists and publishers whose talent and contributions to this field are all too often overlooked. Look for the print version of the debut holiday issue in late November (or download it now), followed by the Valentine’s Day issue in late January 2014 and the Halloween issue in October. Shock Totem Publications is excited to announce the upcoming eighth issue of Shock Totem magazine. 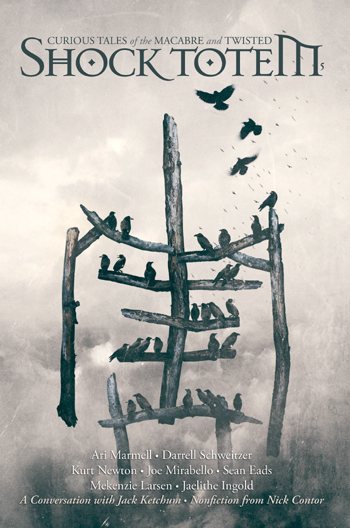 We do not have cover art finalized at this time, but it will once again be created by the amazing Mikio Murakami. We will fill in the blanks as we draw closer to release. Look for it in January 2014! 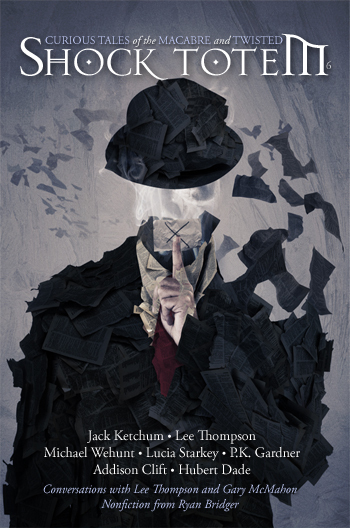 Shock Totem Publications is proud to announce Dominoes, by John Boden. 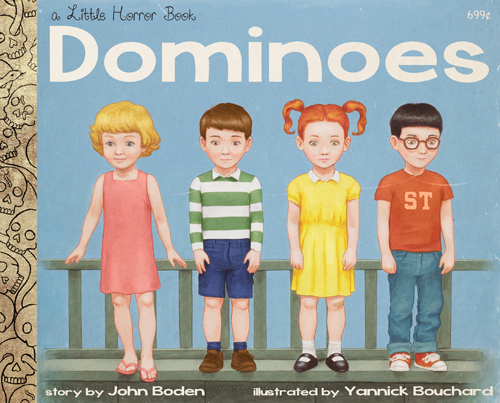 Dominoes is a Little Horror Book, the perfect bedtime read for strange parents and bizarro children, a book not only meant to be read but also experienced. Cover art and interior illustrations were once again handled by the amazing Yannick Bouchard, who also did the cover art and illustrations for Beautiful Sorrows. 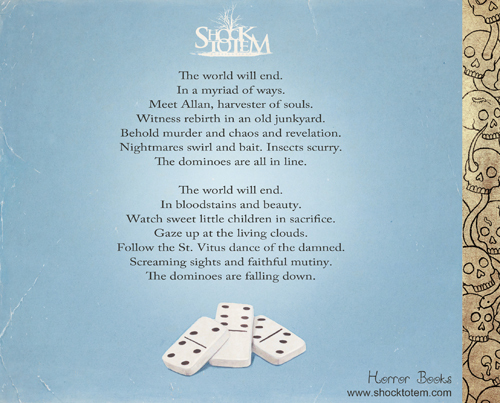 Dominoes will be released in paperback format this coming October. Shock Totem Publications is very happy to announce that our seventh issue is available for purchase! Shock Totem steamrolls ahead with its seventh issue, featuring tales of classic horror, creature features, heartbreak and loss! In addition to all the great fiction, you will find conversations with literary stalwart Laird Barron and Violet LeVoit. 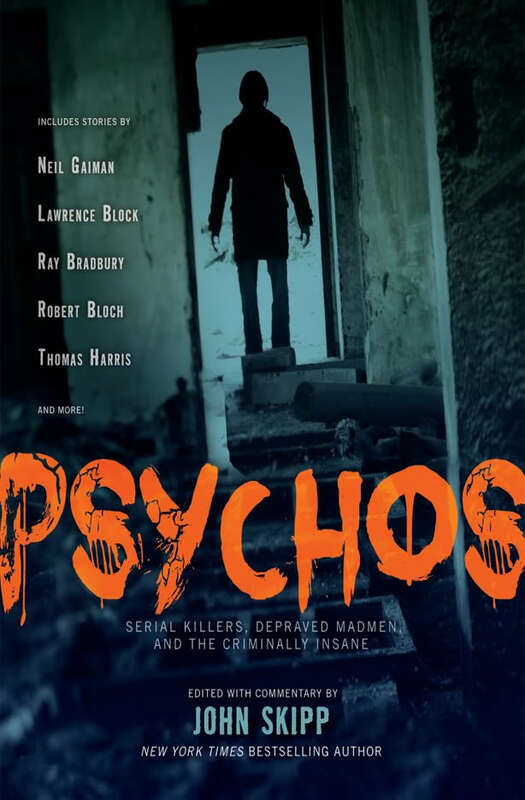 The early 70s are explored in the fifth installment of the horror-in-music serial, “Bloodstains & Blue Suede Shoes.” Narrative nonfiction is handled by Kurt Newton, and with “The Hook, the Hole, and the Garden,” John Boden delivers possibly the most heart-wrenching piece of nonfiction ever published in Shock Totem. 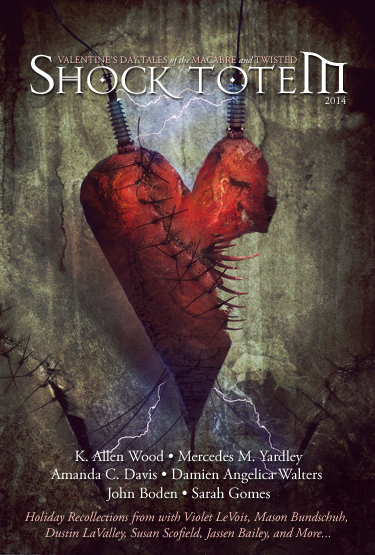 Come see why Shock Totem is billed as “…one of the strongest horror fiction magazines on the market today” (Hellnotes). Currently the print issue can be purchased via our webstore or Amazon. More online retailers will follow in the coming days and weeks. Kindle owners can order the digital copy here. As always, thank you for the support! Here are a handful of links from around the Internet that we found interesting this past week. If you’ve got an hour, check out Booktalk Nation’s entertaining video chat between authors Joe Hill and John Scalzi. If you like things with a more literary bent, you may be interested the benefits of creative people saying no in order to protect their time. The daughter of Alice Walker (author of The Color Purple) writes about growing up in a home with fanatical feminist views. We announced Shock Totem #7! And finally, the creepy short film INSiDE, directed by Trevor Sands. Dig it! Shock Totem Publications is very happy to announce that our sixth issue is available for purchase! Don’t listen to this guy. Tell everyone! Shock Totem returns with its sixth issue, featuring stories that range from troubling tales of loss to chilling examinations of mankind’s dark side. 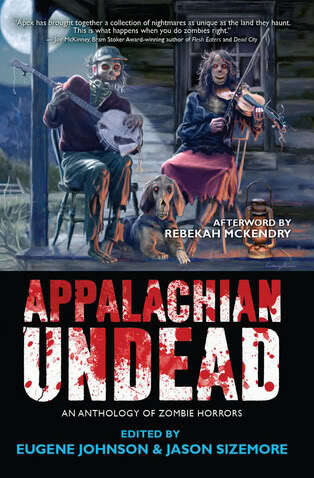 In “Lighten Up,” four-time Stoker Award™-winner and Grandmaster of Horror Jack Ketchum gives us a dose of dark humor that still manages to be righteously menacing. “The River,” by rising star Lee Thompson, is a brutal tale of purgatory, wasted life, and regrets. Soulmates connect through murder, love and revenge in P.K. Gardner’s “For Jack.” In “Orion,” a young girl who has only known darkness makes the ultimate sacrifice—in blood. “No One But Us Monsters,” by Hubert Dade, follows a man who is haunted and tormented by his own crippling fears. Mail hoarding, sin eaters, political horror, Shock Totem #6 runs the gamut. Right on the heels of our fashionably-late fifth issue, we are proud to announce that our sixth issue is primed and almost ready to go. I am doing the layout this time, so I’m making sure everything is perfect. It’s close, though. Once again the cover art was created by the brilliant Mikio Murakami, who has done all our magazine artwork since issue #3. Yet again we feel this issue sits well apart from previous issues, though without straying too far from what readers have come to expect from us. We dig it, and we’re confident you will as well. Look for it soon in digital format. Print will follow shortly after, and if interested you can preorder it here. Shock Totem Publications is very happy to announce that our long-awaited fifth issue is available for purchase! 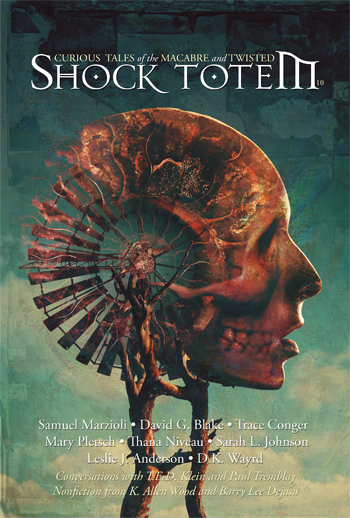 This issue of Shock Totem is yet another eclectic mix of horror fiction and nonfiction, featuring previously unpublished stories from the likes of Ari Marmell, Darrell Schweitzer, Joe Mirabello, Mekenzie Larsen, and others. 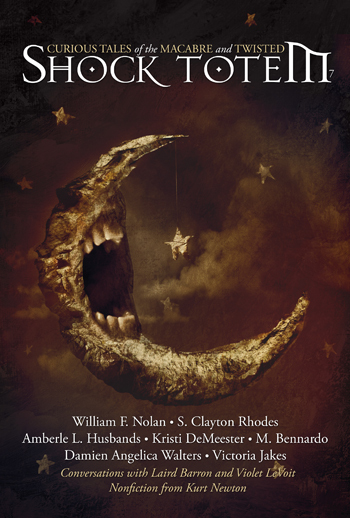 There is also a five-part illustrated microfiction serial, by Kurt Newton, which is something new for us; plus a conversation with horror legend Jack Ketchum, narrative nonfiction by Nick Contor, reviews and more. As of right now, you can order this issue—and past issues, which are all still available—directly from us or through Amazon, in both print ($6.99) and digital ($2.99) formats. This coming weekend, at the fourth annual Killercon convention in Las Vegas, joining the likes of F. Paul Wilson, Wrath James White, Jack Ketchum, John Skipp, Adam Cesare, and more, the Shock Totem Five will be meeting in person for the first time ever. We will have a vendor table all weekend long. If you’re attending, we’d love to meet you. We are hosting a party Friday night as well. I say party, but since everyone shot down all my great ideas–bouncy castle, Sumo wrestler outfits/matches, Andrew WK karaoke battles–I’m not sure how much of a party it’ll be, but it’ll be fun…because when it’s time to party we will always party hard! 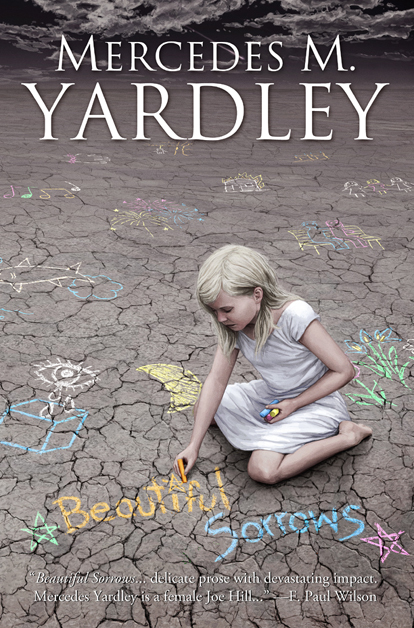 In addition, we will be doing a special pre-release of our upcoming collection, Beautiful Sorrows, by Mercedes M. Yardley. Own it weeks before its official release. We’ll have fifty paperback copies available (there will also be a limited edition hardcover release) at a special discount price. Mercedes will gladly autograph your copy. She’ll be doing a reading from the book as well. For more info, click here. Preorders for the official paperback and hardcover release will go up later today and tomorrow. If you have any questions, please let us know. Some staff news, ya’ll! Cue banjo! The brilliant artwork was created by Cortney Skinner. 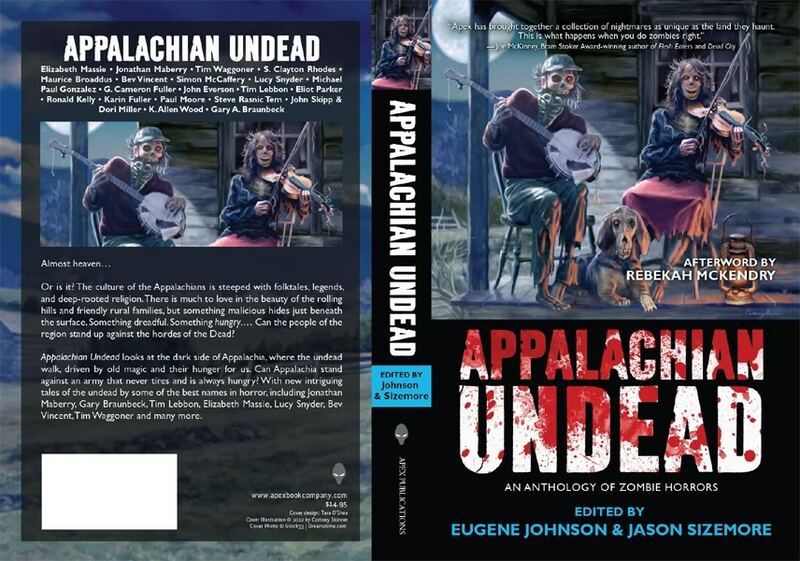 Quite a lineup, too: Elizabeth Massie, Jonathan Maberry, Tim Waggoner, S. Clayton Rhodes*, Maurice Broaddus, Bev Vincent, Tim Lebbon, Steve Rasnic Tem, John Skipp* & Dori Miller, and Gary A. Braunbeck, to name a few more than a few. If you’d like to check out the full table of contents, click here. You can also pre-order via the above link (and get 5% off if you tweet the link), but before you do, check out this groovy contest they’re running for those who do pre-order. As always from Apex Publications, you can expect quality. Not to be outdone, Mercedes and John each have stories—“Murder for Beginners” and “Intruder,” respectively—in Psychos: Serial Killers, Depraved Madmen, and the Criminally Insane, the latest slab—and I do mean slab; these things are massive—in an ongoing series edited by the inimitable John Skipp which has thus far included Zombies: Encounters with the Hungry Dead, Werewolves and Shapeshifters: Encounters with the Beasts Within, and Demons: Encounters with the Devil and His Minions, Fallen Angels, and the Possessed. 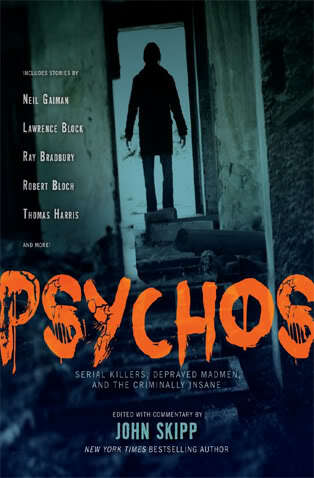 Psychos is due out in September via Black Dog & Leventhal, and features new and classic fiction from the likes of Ray Bradbury, Robert Bloch, Jack Ketchum, Joe R. Lansdale, Lawerence Block, Neil Gaiman, Leslianne Wilder*, Violet LeVoit, Weston Ochse*, Kathe Koja, and many more. If you order now, Amazon has it for $10.07. That’s 608 pages for $10! No-brainer. We hope you’ll buy both!